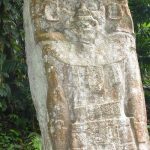 Located on the south-western coast of the Yucatan Peninsula, the colonial era city of Campeche derived its name from the previous Mayan settlement, Ah Kin Pech, which translates as ‘place of snakes and ticks’. Fortunately Campeche is a far more attractive place to spend a few days now, so much so that in 1999 the historic fortified centre of the city was awarded UNESCO World Heritage status. 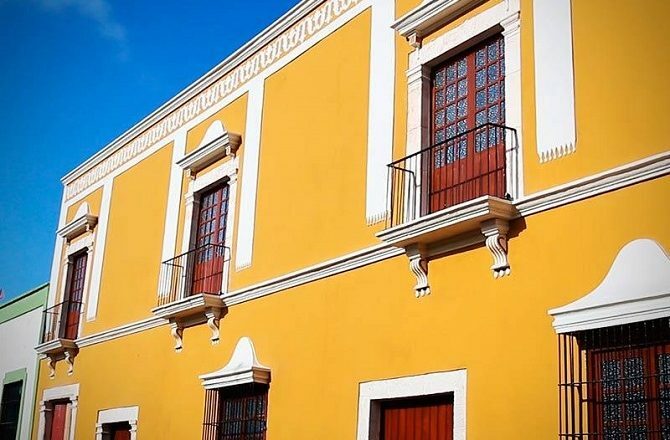 Today, the vast majority of visitors to Campeche will want to stay in hotels either inside the old city walls, the very oldest and most attractive part of the city, or just outside. 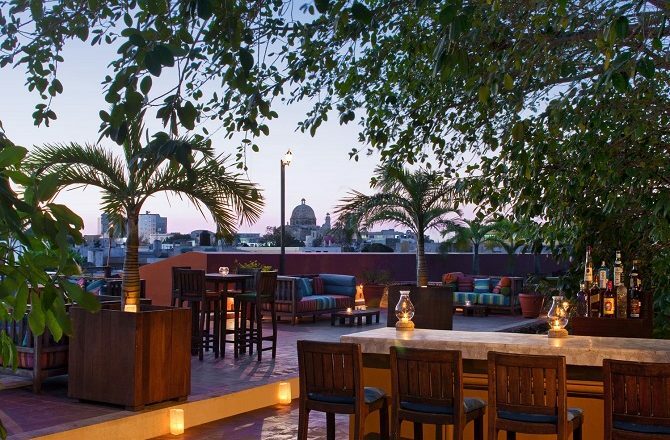 The most luxurious hotel in the city is undoubtedly the Puerta Campeche. 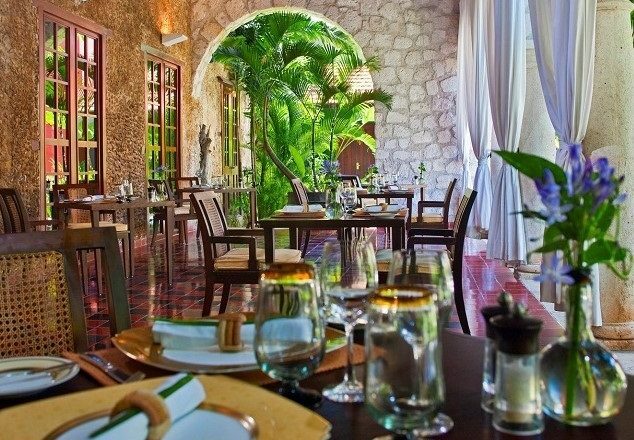 Part of the Starwood Hotels group, the Puerta Campeche is a collection of 17th century buildings that have been merged into a single luxury property in a quiet location just inside the giant, old fortified walls. There are just 15 beautifully appointed rooms, all reflecting local design and furnishings in addition to featuring all the normal, modern creature comforts. At the heart of the hotel is a beautiful pool and stylish restaurant while, on the roof, is the fabulous Terrace bar. As part of its efforts to support the local community, and in tandem with the Fundacion Haciendas del Mundo Maya A.C, the Puerta Campeche works with local Maya communities in order to support their communities and provide economic opportunities. 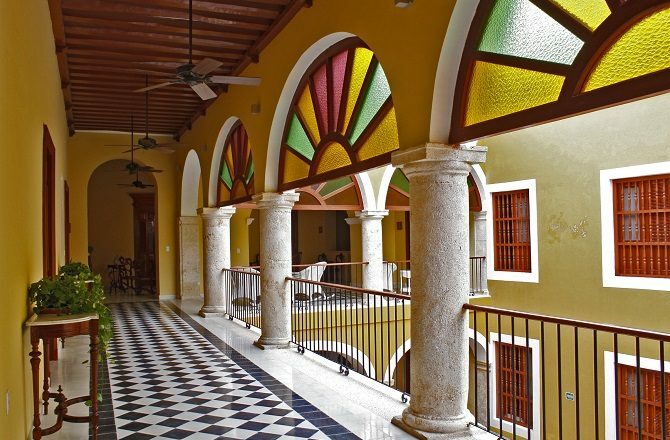 There is no doubt that the Puerta Campeche is the most stylish and luxurious hotel in Campeche although the ‘cheapest’ rooms (and we use that term with a barrel of salt here) sometimes lack a bit of natural light. Special occasions, such as weddings, birthday parties etc can also impinge on other guests’ enjoyment of the hotel. 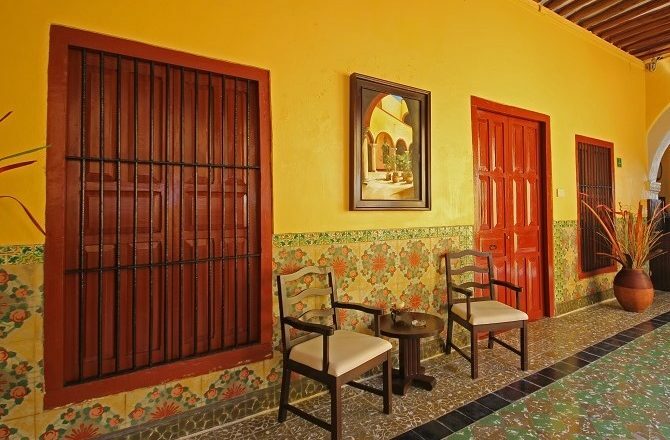 Closer to the city’s main square is another small, luxury heritage hotel, the delightful Casa Don Gustavo. 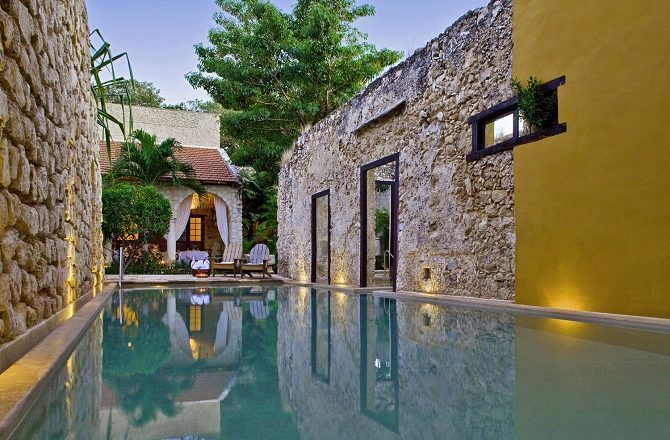 Unlike the aforementioned Puerta Campeche, the Casa Don Gustavo is a single, 18th century colonial home that has only relatively recently been converted into a luxury hotel. 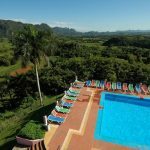 Due to its size and nature, facilities are fairly limited (the hotel ‘pool’) is really just a large rub on the roof but the 10 individually decorated rooms are very attractive. Visitors put off by the price tag at the Puerta Campeche will be glad to hear that, although still expensive, the Casa Don Gustavo is, for now at least, a step down in cost. Beautiful tilework is to be found throughout the property and, although the 24 rooms aren’t luxurious, they are perfectly comfortable and reflect the building’s heritage. 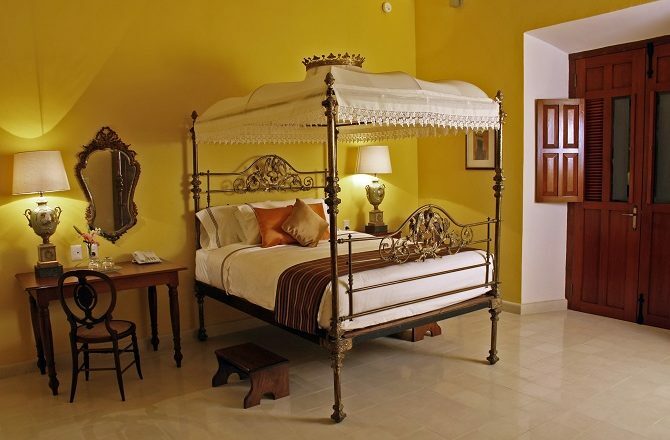 In a similar price range, the Hotel Socaire is another pleasant, heritage style hotel with plenty of charm and character in a central location. Although it only has 7 rooms, the Hotel Socaire has its own cafe, parking lot and swimming pool. Other options worth considering are a couple of sister hotels, the Plaza Campeche and Plaza Colonial. 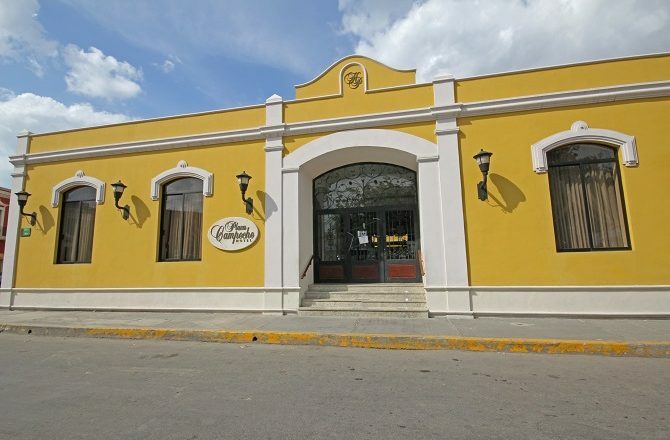 Both properties are faux colonial hotels, one just inside Campeche’s historic centre, the other just outside. 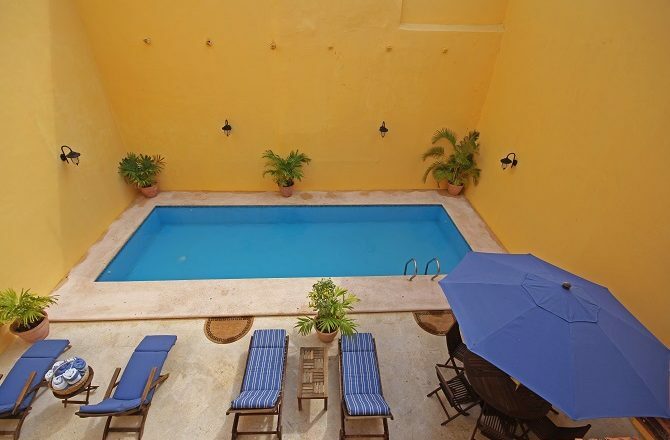 Aside from both being attractive buildings in convenient locations, both hotels also boast swimming pools, an undoubted draw during Campeche’s hot summer season.